To safely lift Bernard Valencia out of his hospital bed, Cheri Moore uses a ceiling lift and sling. 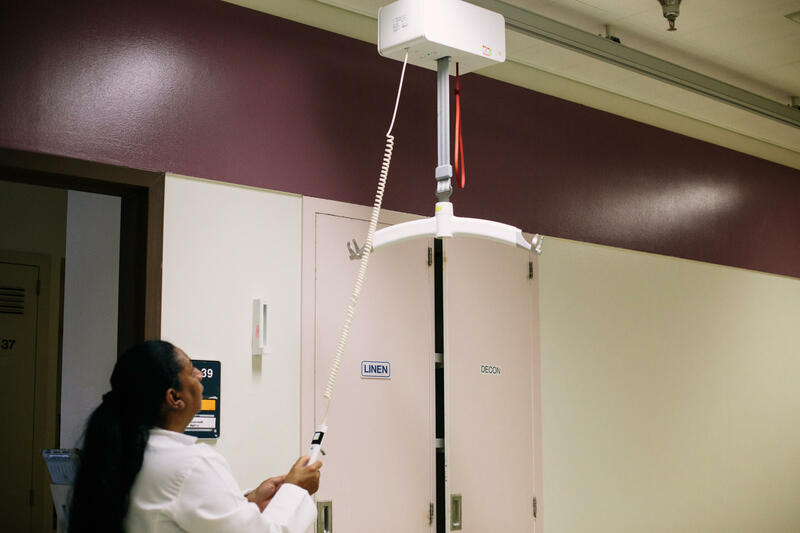 The VA hospital in Loma Linda, Calif., has safe patient handling technology installed throughout its entire facility. 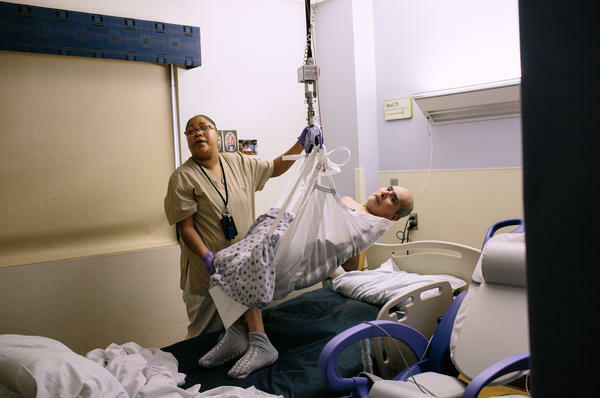 Joleen Beiley and Stephen Gafford lift patient David Eurey using a floating mattress called a HoverMatt, which uses air streams that lift the mattress, making it easy for nursing employees to move a patient from a bed to a gurney. Eurey is moved via a self-driving gurney that does not need any force by the person driving it at the VA hospital in Loma Linda. 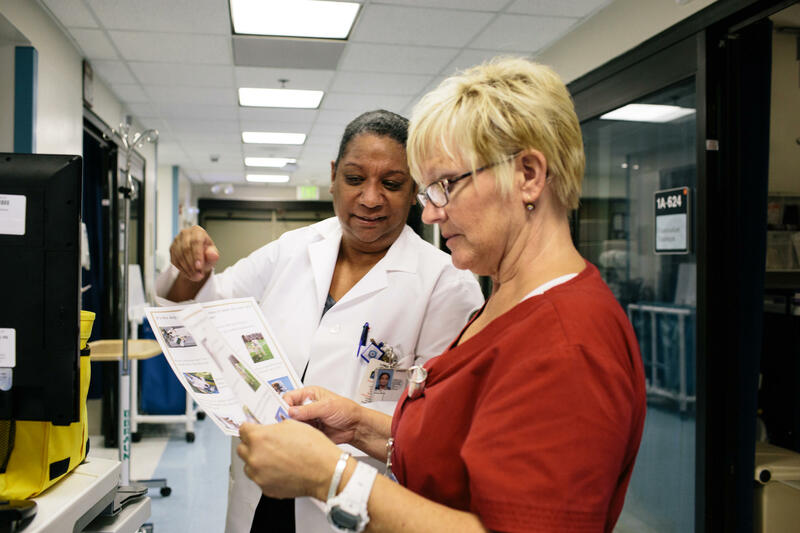 Tony Hilton (left), the safe patient handling and mobility coordinator at the VA hospital in Loma Linda, gives Ruby Baker a safety tip sheet. Tony Hilton, the safe patient handling and mobility coordinator at the VA hospital in Loma Linda, demonstrates one of the hospital's lifts. As NPR has reported in our investigative series Injured Nurses, nursing employees suffer more debilitating back and other injuries than almost any other occupation — and they get those injuries mainly from doing the everyday tasks of lifting and moving patients. But the Loma Linda hospital is part of a nationwide health care system that is proving hospitals can dramatically reduce the rate of injuries caused by lifting — if administrators are willing to invest the time and money. The name of the system might surprise you. It's the VA — the Department of Veterans Affairs. As I stood next to Valencia's bed one morning, he and his nurse Patience Umoffia showed how the hook dangling from the ceiling is protecting the VA's staff. Umoffia needed to move Valencia from his bed to a wheelchair, and then to a shower. Valencia couldn't help: At 65 years old, his body is so twisted by arthritis that he can barely move his hands or legs. If this were a typical hospital, Umoffia would cradle her arms around and under Valencia, drag him to the edge of the bed and then lift him like a life-size doll into the wheelchair. Umoffia says she used to move patients that way — just as hospitals and nursing schools have been teaching for more than a century. "We get so sore," she says. "You barely can even take care of [the patients] the following day." But Umoffia didn't try to lift Valencia using her own muscle. Instead, Umoffia attached the hook dangling from the ceiling to a fabric sling wrapped around Valencia's body. She pushed the button on a control box, and a gentle whir filled the room. The machine slowly hoisted Valencia in his sling a few feet over the bed, swung him until he was dangling in midair over a waterproof wheelchair, and then gently lowered him. "I'm comfortable," Valencia said, adding that he felt "like a little baby" hanging from a stork's beak. Tony Hilton, the hospital's safe patient handling and mobility coordinator, watched as Valencia glided through the air. Nobody at this VA, she said, is allowed to move patients the traditional way anymore. "The guideline is, you're not manually moving or handling patients. You're using technology." The VA's campaign to protect nursing staff started in the late 1990s when one of its hospital directors asked colleagues why so many of the hospital's nursing employees were getting hurt. "Everybody knew" about the epidemic of back injuries, said Michael Hodgson, then a top researcher at the VA. "Nurses knew about it, physicians knew about it, hospitals' administrators knew about it." VA records showed that more than 2,400 of its nursing staff suffered debilitating injuries every year from lifting patients. The injuries "were interfering with their lives at work," Hodgson said. "They were interfering with productivity. They were putting patients at risk because, you know, if somebody gets hurt at work and has to go home, you're down a nurse on that shift." The VA's own studies estimated that its hospitals were spending at least $22 million every year treating back and other injuries among nursing staff. And that figure "likely represents a substantial underestimate," a VA report cautioned, since half of all injuries that interfered with employees' ability to do their work were not reported. So VA researchers started studying exactly how nursing employees perform their jobs — partly by just following them around and observing. Scientists at The Ohio State University's Spine Research Institute did their own studies, too. They wired up nursing staff with sophisticated sensors and discovered that when nursing employees move and lift patients using the traditional techniques they've been taught, the magnitude of forces on their backs is greater than researchers had seen on factory assembly lines. VA officials responded in 2008 by announcing a sweeping program: The agency would transform all of its 153 hospitals to prevent nursing staff from getting hurt. "In recent years, a patient body weight of 35 pounds was established as the maximum weight that providers can safely lift when lifting and moving patients without the risk of injury," the VA declared. "This limit requires a new approach to lifting and moving patients." Since it began, the VA has spent more than $200 million on what it calls "the safe patient handling program." The most visible signs of the program at Loma Linda are the ceiling lifts, like the one that hoisted Valencia. The VA is by no means the only system that uses them — administrators at some private hospitals across the country told me that they have lifts in a portion of their rooms, such as in the intensive care unit, and perhaps some rooms reserved for patients getting surgery. But researchers told me they've seldom seen a hospital embrace lifts as dramatically as Loma Linda and other VA medical centers have. Staff engineers at Loma Linda ripped up parts of the ceilings and installed lifts in all 207 patient rooms, at a cost of roughly $2 million. They also installed lifts just about everywhere else patients need to go, according to Hilton, including imaging departments, clinics and the dialysis center — even the morgue. And the hospital is trying to prevent injuries with more than lifts. For instance, workers move some patients on HoverMatt floating mattresses: Just connect the mattress with a pump, and it shoots air streams through thousands of tiny holes under it, so the mattress almost levitates. This way, workers don't have to lift a patient from a bed onto a gurney. They can float the mattress over using just one hand — although HoverMatt recommends using two. Hilton also persuaded hospital administrators to replace their traditional gurneys, which nursing employees have to push, with power gurneys that employees drive at the touch of a button. Again, the VA is not unique in using equipment like that — it's unusual because every corner of the hospital has it. Still, the VA has discovered that all the equipment in the world does not prevent injuries on its own. When Hilton came to the Loma Linda VA six years ago, for instance, many of the rooms were already outfitted with lifts, but most nursing employees ignored them. "It was actually a laughing matter in the beginning," Hilton said. The staff said, "'Oh, no, lifts? They don't work. Takes too much time.' They were used to their old ways. They wouldn't use it. We have been taught for years that we manually handle patients," she said. "So to undo that in your brain is a cultural change. They have to buy into it." Hilton realized that to make that cultural change, they needed to train the nursing employees over and over again. At the Loma Linda VA, the training starts practically the first day employees come to work. 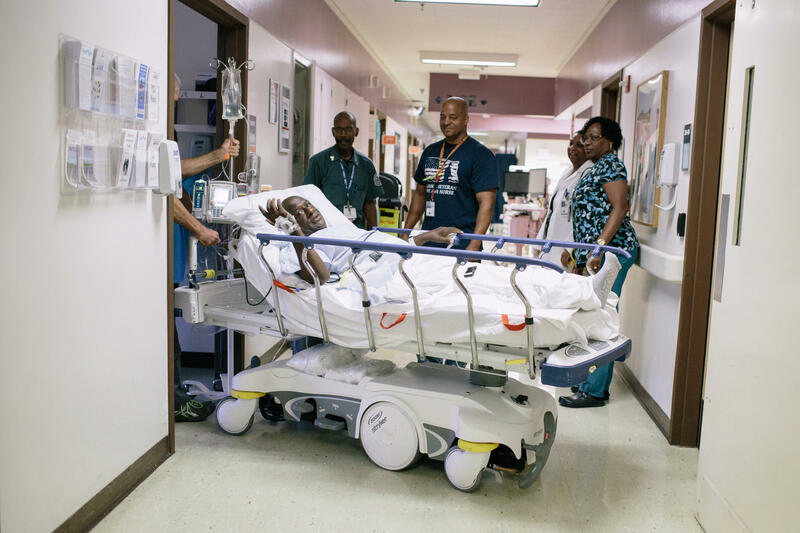 One morning, I watched Hilton walk to the podium in the hospital's auditorium and gaze out over a new batch of nurses, nursing assistants and other staff. "So," Hilton asked them, "anybody here who knows what in the world is safe patient handling all about?" "For a 200-pound man, how much do you think that leg weighs?" Hilton continued, and the new employees started to murmur. "Anybody want to guess? Can go up to 45 pounds," she said. Hilton told the new employees they would not be allowed to move patients anymore without using lifts or other equipment. Officials at private hospitals told me they teach employees to move patients safely, too — typically by sending them to an hourlong class, perhaps once per year. But Hilton says training that infrequently is not likely to work. At the Loma Linda hospital, they're constantly training employees how to use lift equipment, partly with "peer" trainers. There's at least one employee on every unit, every shift, 24 hours a day, assigned to coach colleagues on how to use safe lifting technology. Outside trainers also conduct workshops frequently. One afternoon, we dropped by a room where nurses from the intensive care unit were learning how to use a brand-new machine that takes over the job of turning patients onto their stomachs. One of the trainees at the session, Tiffany Gratton, said she worked at roughly 20 private hospitals as a substitute nurse before she came to the VA a few years ago. None had a program like this. "In my 12 years of experience I've not experienced this type of system for safe patient handling," Gratton said. "They never stressed the injuries that could be sustained." Researchers in the VA have discovered that there's one more ingredient that hospitals need if they're going to prevent injuries as much as possible: what they call a safety "champion." They need a full-time coordinator like Hilton to remind the staff every day — including managers — that it's a priority in the hospital to protect employees' backs. Hospital administrators told me that without Hilton's constant lobbying, armed with research to bolster her arguments, they wouldn't have invested so much money in safe patient handling. Rank-and-file nursing employees said that without Hilton's prodding, they wouldn't remember to use the equipment. Hilton spends a typical day speed-walking from one unit to the next, making sure the staff is staying safe. "Any issues here we need to take care of with safe patient handling today?" she asks employees in the emergency room as she breezes through the department. "Do you have what you need to do your job?" The employees call out to her, "Yes." "Remember, I'm your guardian angel," Hilton told them. "You know I've got your back." Federal researchers have been studying the results. 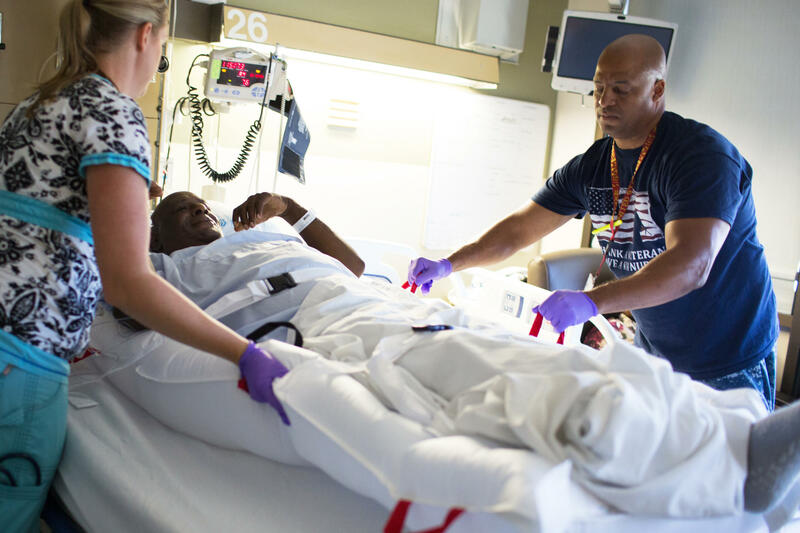 They show that VA hospitals across the country have reduced nursing injuries from moving patients by an average of 40 percent since the program started. Hilton says the reduction at the Loma Linda hospital has been closer to 30 percent — but the injuries that employees do suffer are less serious than they used to be. Loma Linda spent almost $1 million during a recent four-year period just to hire replacements for employees who got hurt so badly they had to go home, Hilton said. Last year, the hospital spent "zero." She said nobody got hurt badly enough to miss work. NPR's investigation's unit has been exposing an epidemic in U.S. hospitals. Nursing employees suffer more debilitating back and other injuries than almost any other occupation. They get hurt from lifting and moving patients. Today, we're going to hear how one of the nation's largest healthcare systems is proving many of these injuries can be prevented. And the name of that system may be surprising. As NPR's Daniel Zwerdling reports, it's the VA.
DANIEL ZWERDLING, BYLINE: You've probably heard negative stories recently about the Department of Veterans Affairs - long wait times and all that. But when it comes to nursing employees wrecking their backs, researchers say the VA has done more to prevent those injuries than any hospital system in America. And Bernard Valencia's room shows how. PATIENCE UMOFFIA: Mr. Valencia, right now - I'm going to lift you up right now. ZWERDLING: Valencia is a patient in the VA hospital in Loma Linda, Calif. His nurse has just walked into the room on one south to give him a shower. Valencia is 65 years old. His body's all twisted. He can barely move his hands or legs. BERNARD VALENCIA: I have rheumatoid arthritis. I'm stiff as a board. ZWERDLING: That poses a potentially dangerous challenge for his nurse, Patience Umoffia. How will she move Valencia from his bed to the shower? If this were a typical hospital, she'd cradle her arms around him and drag him to the edge of the bed. Then she'd lift him like a life-sized doll into a wheelchair. Umoffia says she used to move patients that way. That's what hospitals and nursing schools have been teaching for 100 years. Did you ever have any back issues? UMOFFIA: Yes. We get so sore, we barely can even take care of them the following day. ZWERDLING: In fact, the VA's records show that more 2,400 workers at their hospitals used to get injured every year just from lifting patients. But since then, the VA has transformed the way that employees handle patients. Umoffia grabs a hook that's dangling from the ceiling, and she attaches it to a sling around Valencia's body. She pushes a button and now a machine that's mounted in the ceiling lifts Valencia out of his bed and it raises him a few feet up in the air. Then it ferries him until he dangles over the wheelchair. VALENCIA: I'm comfortable. I feel like a baby in a stork. ZWERDLING: You look kind of like a baby hanging from a stork's beak. VALENCIA: That's what it feels like. I feel like a little baby. ZWERDLING: And then, the machine gently lowers him into the chair. Tony Hilton has been watching all this. She runs the hospital's campaign to prevent their staff from getting injured. Hilton says nobody at this VA is allowed to move patients the traditional way anymore. TONY HILTON: The guideline is you're not manually moving or handling patients. You're using technology. ZWERDLING: So you're saying your edict here - the edict in the whole VA is you do not manually handle patients? HILTON: That's correct, not for lifting and moving them. ZWERDLING: It doesn't sound possible. HILTON: Well, we're doing it. (Laughter). ZWERDLING: The VA's campaign to protect nursing staff started in the late 1990s. VA studies showed they were spending at least $22 million per year just on injuries that nursing employees got from lifting. MICHAEL HODGSON: They were interfering with their lives at work. They were interfering with productivity. ZWERDLING: Michael Hudgson was one of the VA's top researchers. HODGSON: They were putting patients at risk, because, you know, if somebody gets hurt at work and has to go home, you're down a nurse on that shift. ZWERDLING: So the VA's top officials decided we have to transform all 153 hospitals in our system to help prevent nursing staff from getting hurt. They called the campaign safe patient handling. Over the past six years, the VA has spent more than $200 million reinventing how nursing employees move patients. The most visible sign is the machines, like the one that moved Bernard Valencia. OK, so we're in 1A 627B. Does this have a lift? HILTON: Yes, it has a lift? ZWERDLING: Now, a lot of hospitals around the country have bought some equipment to help the staff move patients. But Hilton says here at the Loma Linda VA, they ripped up the ceilings and installed motorized lifts in every patient room. I keep checking to see if she's exaggerating. The room across the hall - 1A 625? HILTON: Every room has a lift. It's ever-present. ZWERDLING: And the hospital's trying to prevent injuries with more than lifts. For instance, they move some patients on floating mattresses. UNIDENTIFIED NURSE: Ready? One, two, three - I'm going to inflate. ZWERDLING: And a pump shoots air streams through thousands of tiny holes under the mattress until it almost levitates so workers don't have to lift a patient from a bed to a gurney. They can pretty much float the mattress over with one hand. Still, the VA has discovered that all the equipment in the world does not prevent injuries on its own. When they started buying the equipment, most employees ignored it. HILTON: It was actually a laughing matter in the beginning. They said oh no, lifts? They don't work. It takes too much time. They're used to their old ways. They wouldn't use it. ZWERDLING: But here's what I don't get totally - it seems like management should be able to just say to the staff, look, this is what you - you're already shaking your head no. (Laughter). HILTON: No. It's not as easy as the management telling the staff to do it. We have been taught for years that we manually handle patients. So to undo that in your brain is a culture of change. They have to buy into it. ZWERDLING: Tony Hilton says to get employees to buy into it, you have to train them. HILTON: So all about safe patient handling - anybody here knows what in the world is safe patient handling all about? ZWERDLING: On a recent morning, Hilton stands at the podium in the hospital's auditorium. A batch of new employees has come for orientation. HILTON: For a 200-pound man, how much do you think that leg weighs? Anybody wants to guess? It can go up to 45 pounds. ZWERDLING: Officials at other hospitals around the country have told me we train our employees to move patients safely, too. We send them to an hour-long class every year, to which Tony Hilton says no, no, no, that won't work. We're constantly training here at the VA.
For instance, there's at least one employee on every unit 24 hours a day who coaches colleagues how to use the equipment. And we drop by a room where nurses in the ICU are learning how to use a brand-new machine that takes over the job of turning patients onto their stomachs. HOSPITAL TRAINER: Use that yellow tab, swing it down. ZWERDLING: Tiffany Gratton is taking this class. She says she was a substitute nurse at roughly 20 hospitals before she came to the VA a few years ago. And nobody had a program like this. GRATTON: Zero. In my 12 years of experience, I've not experienced this type of system for safe patient handling. They never stressed the injuries that could be sustained. ZWERDLING: Researchers in the VA have discovered that there's one more ingredient hospitals need if they really want to prevent injuries. They need what they call a safety champion. They need a Tony Hilton who's constantly in your face. HILTON: Can I grab you for a minute? ZWERDLING: During the day I spent with her, Hilton speed walks from one unit to the next. At this moment, she's in the emergency room, and she's nudging people. Use that equipment. Don't hurt your back. HILTON: Any issues here we need to take care of with safe patient handling today? ZWERDLING: Hilton says nobody got hurt badly enough to miss work. Daniel Zwerdling, NPR News. Transcript provided by NPR, Copyright NPR.